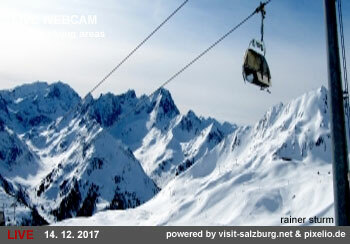 There are several webcam services available that specialise on snow reports and live images from skiing areas in Austria. Several of them operate webcams in the ski ressorts of Salzburg, of which Großarl is among the most important. This article highlights some "snow cams" from Großarl and its immediate surroundings that we found particularly useful. Various Webcams from Großarl: Feratel is a tourism media company that offers and maintains web cameras in various locations in Austria; from the page linked here, you get to the cams for Großarl. Bergfex Großarl Alm Webcams: The website bergfex is a travel site dedicated to the Alps and mountainous activities. This link takes you to their overview on webcams from Großarl and surroundings; much of this overlaps with the webcams presented in the links above, but there are one or two exceptions. Großarl & Großarltal Valley Webcams: A private website dedicated to the Großarltal; a very nice array of webcams from Großarl and the wider valley, high resolution and conveniently arranged. Official Website Großarl with Webcam: The official website of the Großarltal Valley and Großarl has an overview on webcams from the area, too. A mix of webcams aiming at the slopes, village and the valley in general. Großarl Webcam by Ski Amade: The town of Großarl is part of the Ski Amade region, an association of ski ressorts in central Salzburg and surroundings. On its website, Ski Amade offers this Großarl webcam with a view on the slopes.